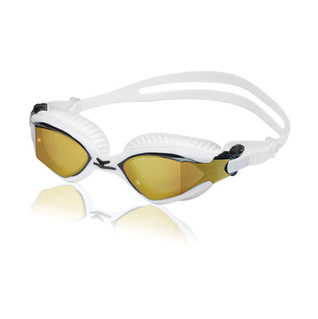 Same as the Speedo MDR 2.4 Goggles with mirrored lenses for sun protection if you swim outdoor. I usually use Aqua Sphere goggles becase I like the easy adjust side clips. Howwever the Aquasphere goggles are not fog free, even though they are advertised as such. I thought that I would try the Speedo goggles since they have an easy adjust side clip similar to the Aquashere goggles. 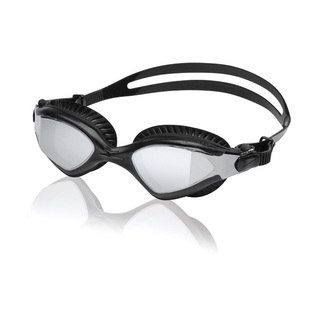 Also the Speedo goggles advertise that they will have less pressure on the eyes which they do. Also the fog free lens works very nicely. My only complaint is that the adjustable side clip broke the very first day that I wore the goggles so that I cannot tighten one lens securely. I would have given a higher rating if the adjustable side clip were more durable and not break the very first day of use. Nice goggles but leak a little. If I can't sell them to a friend I'll return them. Not the goggles fault , just not a good match for my face. Confotable, no leaks, good vision.